It’s coming our way this weekend with lows down in the single digits. Now is the time to start preparing for the extreme cold. Put together an emergency kit for your vehicle that includes a blanket and other supplies that will be useful if you get stuck. Yes, you may be planning to just make a 10 minute trip to the grocery, but what happens if you run off the road or get stuck? What happens if your cell phone battery goes down or the cell tower is out? For some great information on how to prepare for the life-threatening cold that is coming our way go to https://www.ready.gov/winter-weather. The KYTC District 1 Snow and Ice Team is monitoring the approaching system. Due to rain expected before the transition to frozen precipitation Saturday night, our highway crews are not likely to be able to pre-treat highways. Salt and other ice-fighting chemicals have minimal impact below about 15 degrees. When temperatures get below that it can severely limit the ability of highway crews to improve driving conditions. Winds within the system are likely to limit visibility on the road. 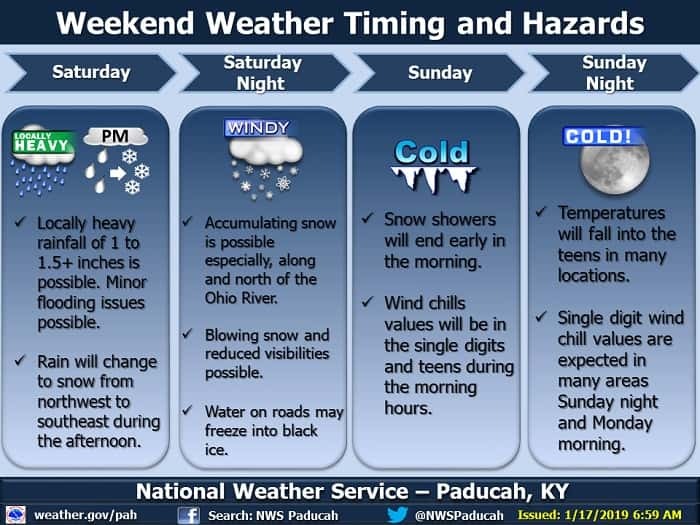 The National Weather Service Paducah Office has updated the timeline of weather and hazards for this weekend. As for the weather forecast, please monitor the NWS or local news media for regular updates at this system containing extreme cold temperatures approaches. NWS indicates we should expect locally heavy rain Saturday morning transitioning to snow and gusty northerly winds from northwest to southeast during the afternoon and early evening hours. Travel Saturday afternoon and evening could be difficult with snow accumulations, reduced visibility from blowing snow, and black ice. Much colder conditions are expected Sunday into Monday.